Tuesday February 9 1909 I had churning for the morning. The weather turned very bad after noon. I had thought to go down home and stay till after the Recital at the church tonight. It was so stormy that I was very glad I did not get away from home. Wednesday February 10 1909 Weather very cold I did nothing but the work and work some on tatting I am making for a sideboard scarf. Will went down town taking the home folks their butter. I wrote to Lydia tonight. 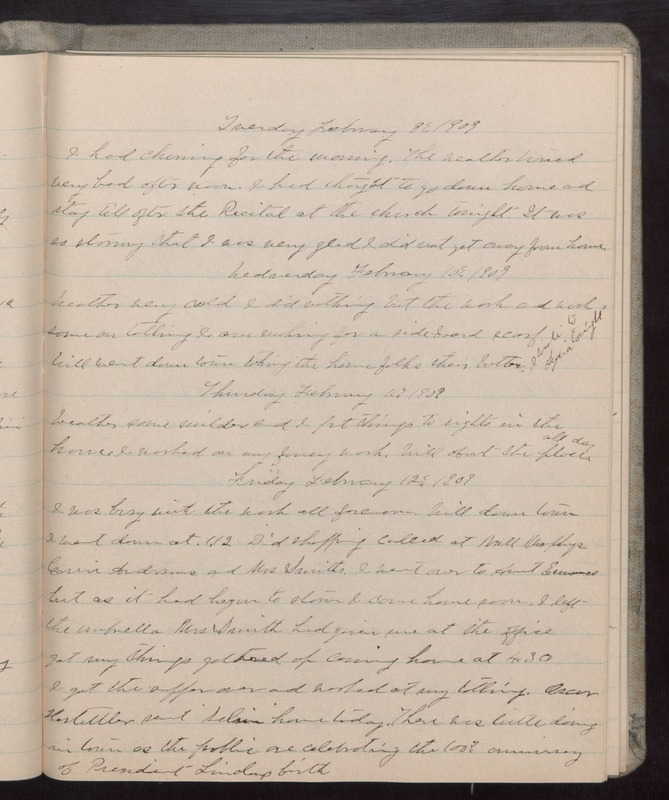 Thursday February 11 1909 Weather some milder and I put things to rights in the house I worked on my fancy work. Will about the place all day. Friday February 12 1909 I was busy with the work all forenoon. Will down town I went down at 1.12 Did shopping called at Nell Murphys [illegible] Andersons and Mrs Smiths. I went over to Aunt Emmas but as it had begun to storm I came home soon. I left the umbrella Mrs Smith had given me at the office got my things gathered up coming home at 4.30. I got the supper over and worked at my tatting. Oscar [Hostattler?] sent [illegible] home today. There was little doing in town as the public are celebrating the 100th anniversary of President Lincolns birth.